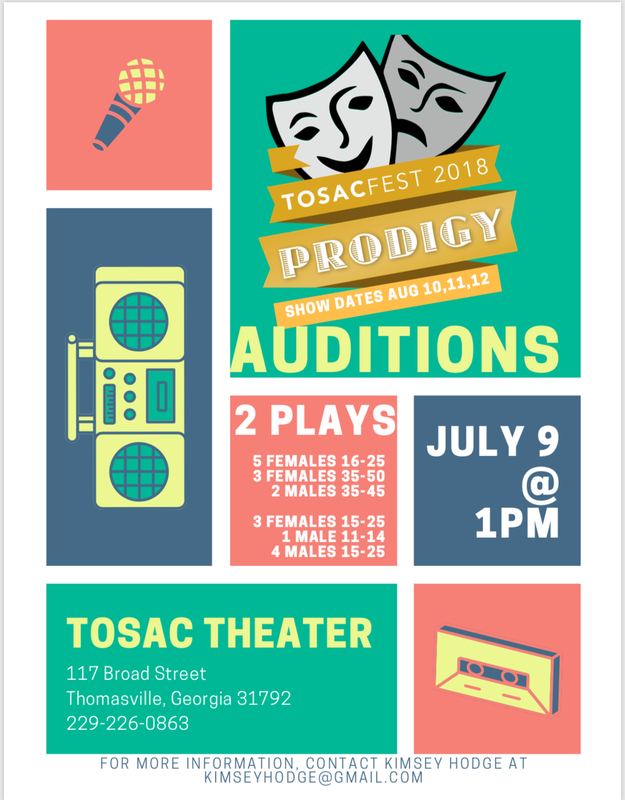 Auditions for TOSACfest-Prodigy will be held at the Storefront Theater on Monday July 9th at 1PM. *This year TOSAC is featuring 2 original works from 2 local upcoming playwrights selected by the TOSAC Board from submissions received for the festival. Show dates are August 10th, 11th and 12th with 3 shows planned that will include both plays being performed. Play 1 – 5 females 16-25, 3 females 35-50, and 2 males 35-45. Play 2 – 3 females 15-25, 1 male 11-14 and 4 males 15-25. *Actors may be cast for 1 or both of the plays. *Actors may prepare a self chosen reading or monologue if desired, however, the casting director will have something for the actors to cold read as well. In addition, TOSAC is also seeking a Director for one of the plays. Those interested in Directing should email TOSAC as soon as possible at tosacinfo@gmail.com.